Born in Jiaganj, West Bengal. Member, Academy of Fine Arts, Calcutta. Member, AIFACS, New Delhi. 1939, 49, 56 Commissioned to decorate annual sessions of Congress in Ramgarh, Jaipur and Amritsar. 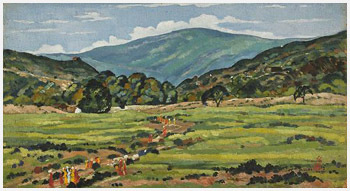 1944 First Prize for card design, The Patra All India Exhb. 1945, 49, 50 Silver Medal, Academy of Fine Arts, Calcutta. Gold Medal, University Institution Exhb., Calcutta. 1981, 82 Award, West Bengal Academy of Dance, Drama, Music and Fine Arts, Calcutta. Founder member, Murshidabad Sangha. 1986 Received 8th Sangeet Shyamala Award, Calcutta. Illustrated a number of childrens books. Art Critic in Bengali journals like Desh and Ananda Bazar Patrika. The Indian Embassy presented one of his paintings to Govt. of USSR. Self-taught artist with no academic training in art. Early art education under his father, Hirachand Dugar. Studied under the tutelage of Nandalal Bose. 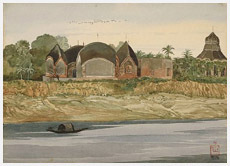 1945 Exhibited regularly, Academy of Fine Arts, Calcutta. 1946 International Modern Art, organised by UNESCO, Paris. 1949, 75 Solo exhb., Calcutta. 1954, 65, 77 Exhb., Jiaganj, Murshidabad. 1955, 56 Exhb. of Indian Art, organised by Lalit Kala Akademi, Czechoslovakia, Romania and Bulgaria. 1959 Solo exhb., inaugurated by President Dr. S. Radhakrishnan, New Delhi. 1964 Solo exhb. sponsored by Lufthansa and Deutschewelle, West Germany. 1968 Exhb., Kala Bhavan, Santiniketan. Birla Academy of Art and Culture, Kolkata. When in the 60s, the Bengal School strayed into the backwater of the Indian art scene, Indra Dugar was one of the few who fought to enrich the tradition with fresh vigour and vividness as witnessed in this painting. True to the ideal of the Bengal School, Indra Dugars quest is not only for the past enshrined in the present but also in its transforming into the timeless.